Pollinator Link | Bringing birds, butterflies and bees to backyards. 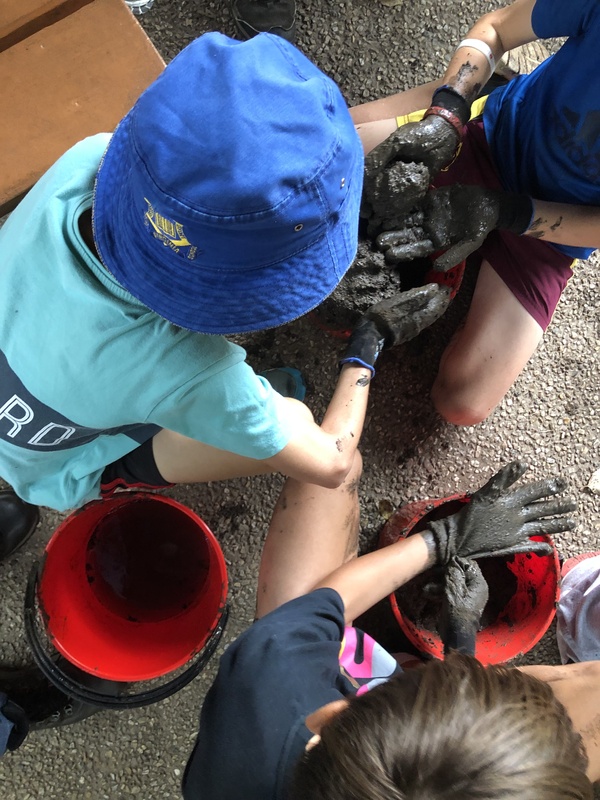 Kids and mud … always a winning formula. 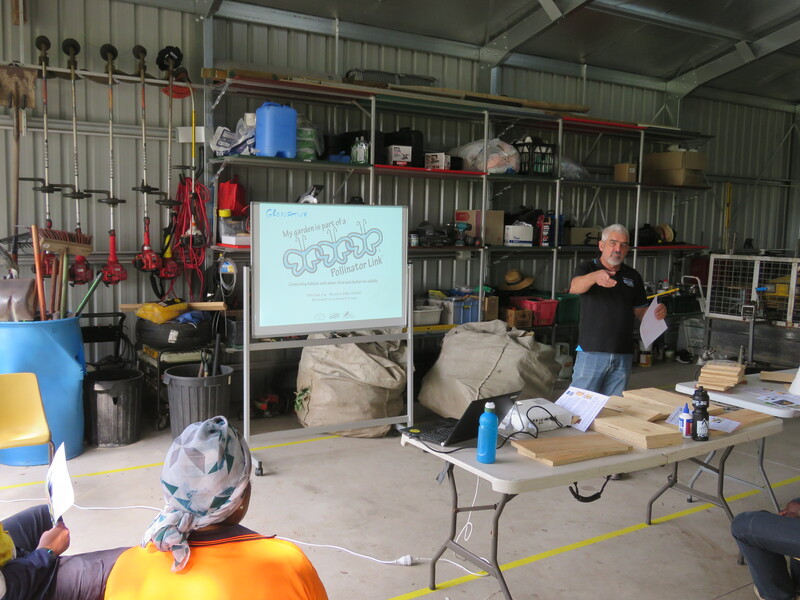 Jake Slinger and I led a Pollinator Link® workshop for the Nature Rangers at Downfall Creek Bushland Centre yesterday. Australia has over 2,000 species of solitary native bees. Solitary bees do not form live in a hive or produce honey however they are the most effective pollinators for our backyard vegetable gardens. 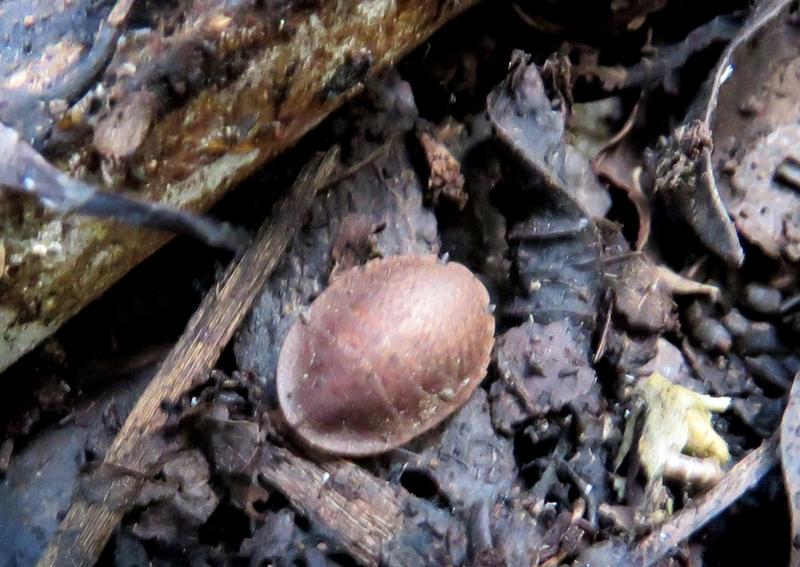 Blue Banded Amegilla sp. and Teddy Bear Amegilla sp. native bees do buzz pollination. Blue Banded bees shake pollen out by banging the flower with its head. Common edible plants such as tomatoes, blueberries and eggplant need buzz pollination which cannot be provided by European Honey bees. Female Blue Banded and Teddy Bear bees make nests in the ground which they fill with pollen and nectar, lay their eggs then seal. When the egg hatch in spring the young bees feed on the stored food before burrowing out and getting to work pollinating our vegetable gardens. Step 1: Make the mud. 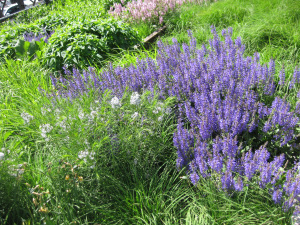 Garden soil, add water then stir with lots of laughter. 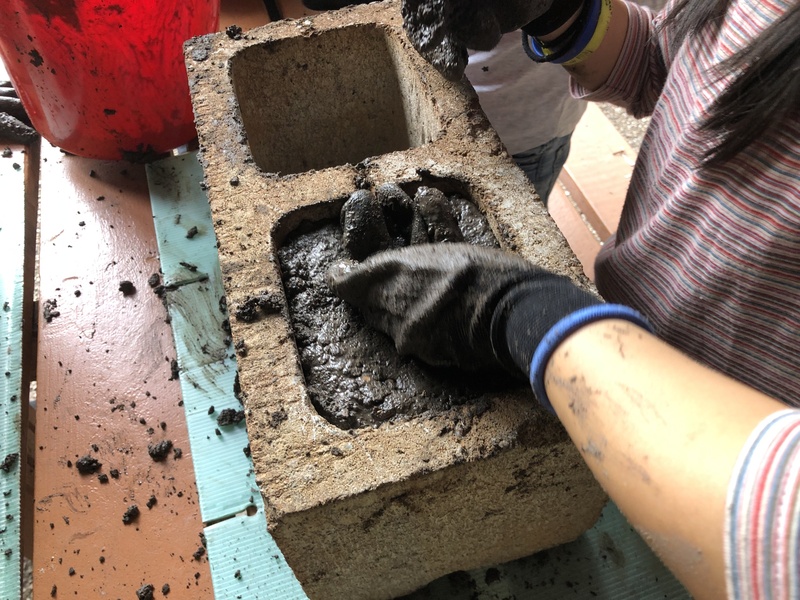 Step 2: Make a mud pie in concrete block. Add more laughter. Step 3: Finish with starter holes for bees wanting to nest. Leave Bee Home to dry then install in a place sheltered from rain. 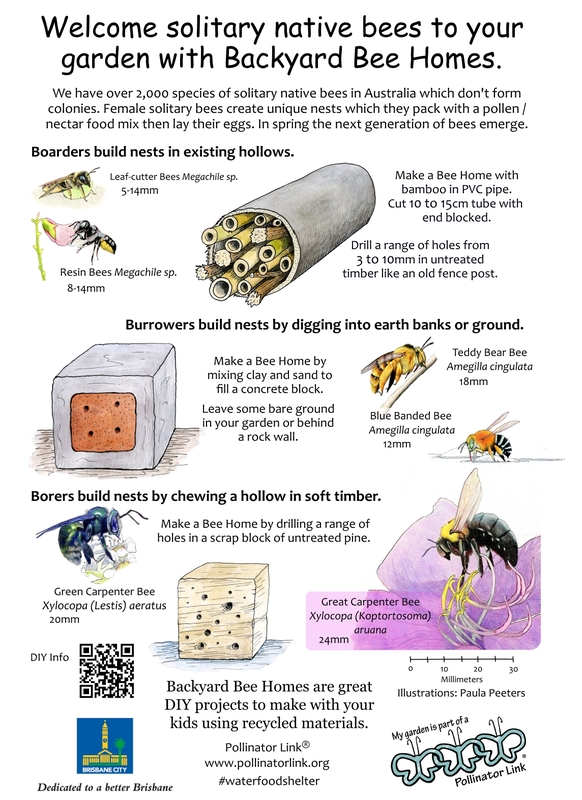 Bee Homes completed, the Nature Rangers worked on building nest boxes to provide homes for birds. 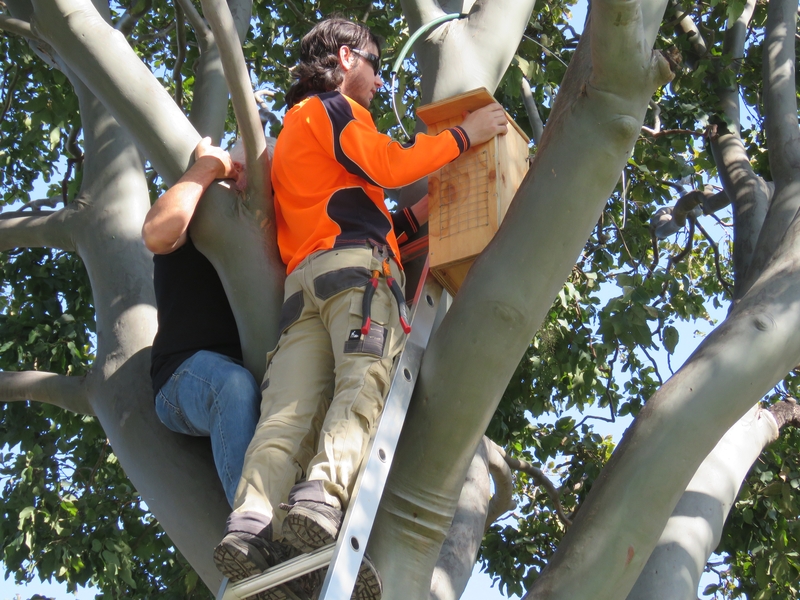 Clearing trees for building houses means that there is a lack of nest hollows for birds and other species like Squirrel Gliders Petaurus norfolcensis. 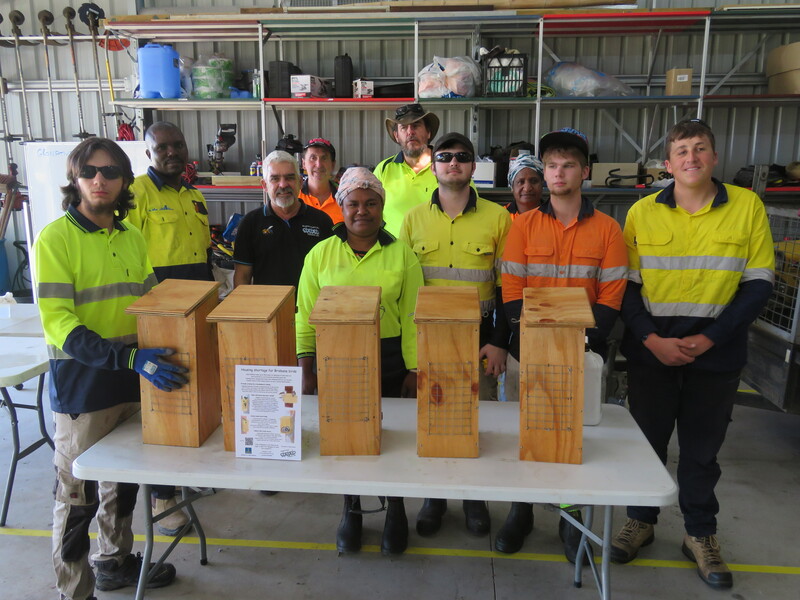 Timber for the nest boxes is reused hardwood ply donated by Benchmark Scaffolding at Yatala and pre-cut at Carina Mens Shed. Box design came from “Nest boxes for wildlife: A practical guide” by Alan & Stacey Franks of Hollow Log Homes. First step in box construction is learning to use a hammer correctly. It is less about size and strength and more about letting the weight of the hammer to do the work. Another tip we shared is to blunt nail heads when nailing timber that splits easily. 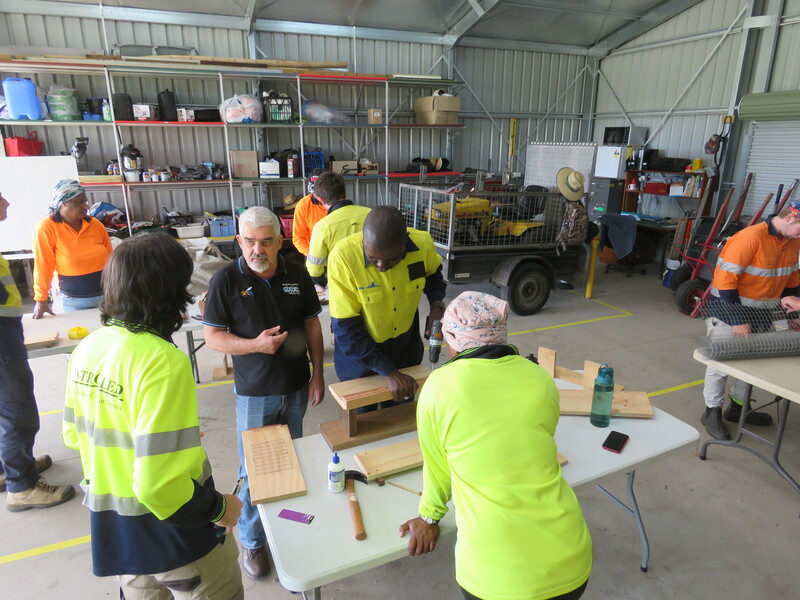 Jigs prepared at Carina Mens Shed are used to simplify assembly. New homes ready for installation. 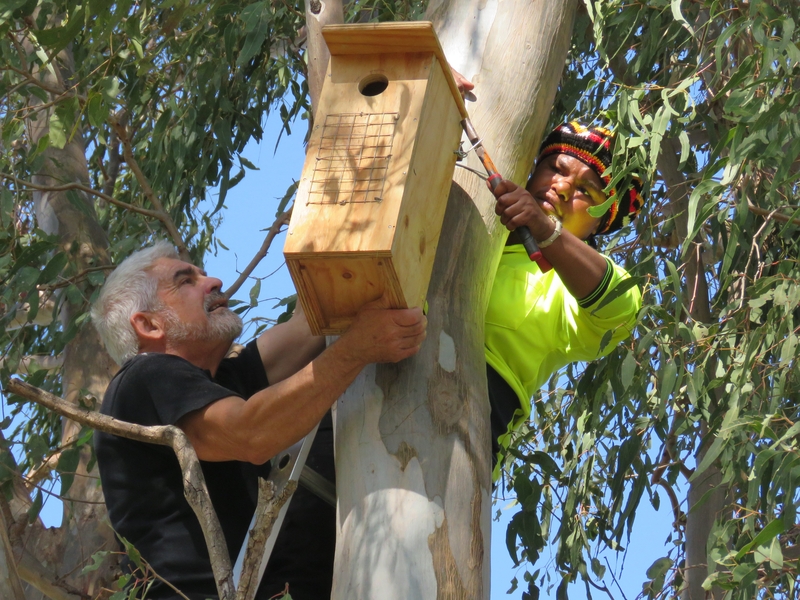 The Downfall Creek team will arrange installation of the new homes for our homeless urban birds. 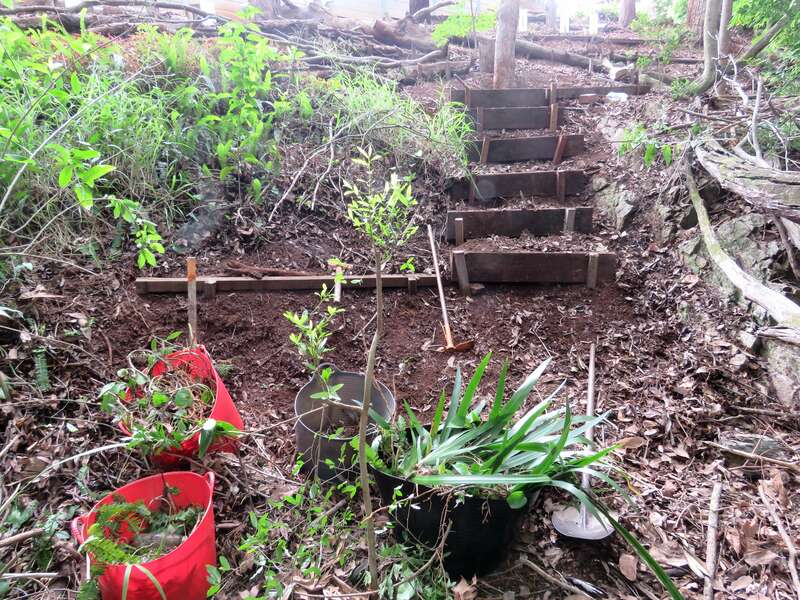 Steep sides make gully restoration complex so the first step is building access steps. Working from the bottom clearing weeds facing uphill is much safer and faster. Logs or recycled hardwood can then be installed to provide a safe work place and manage erosion. 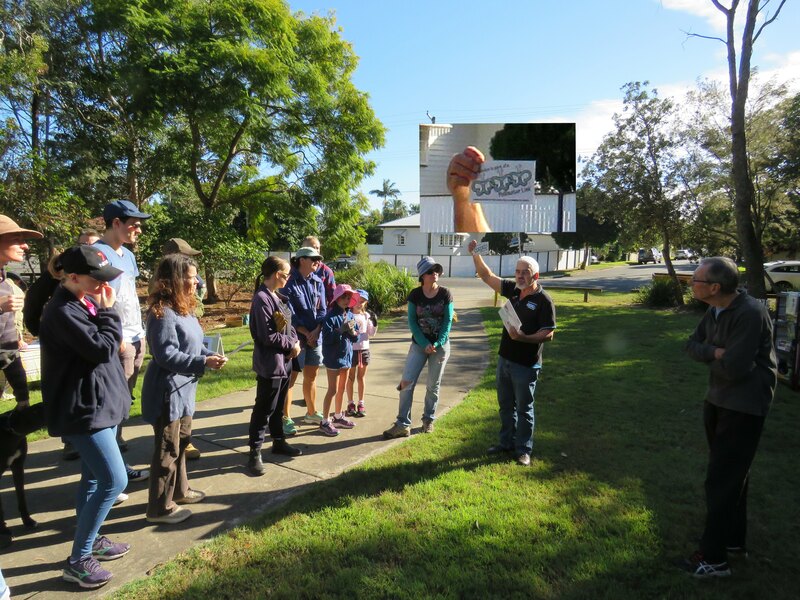 Restoring the Wildlife Corridor is community effort to clear rubbish and remove the invasive Madeira Vine Anredera cordifolia in the backyards linking Mt Gravatt Conservation Reserve down to Klumpp Road. 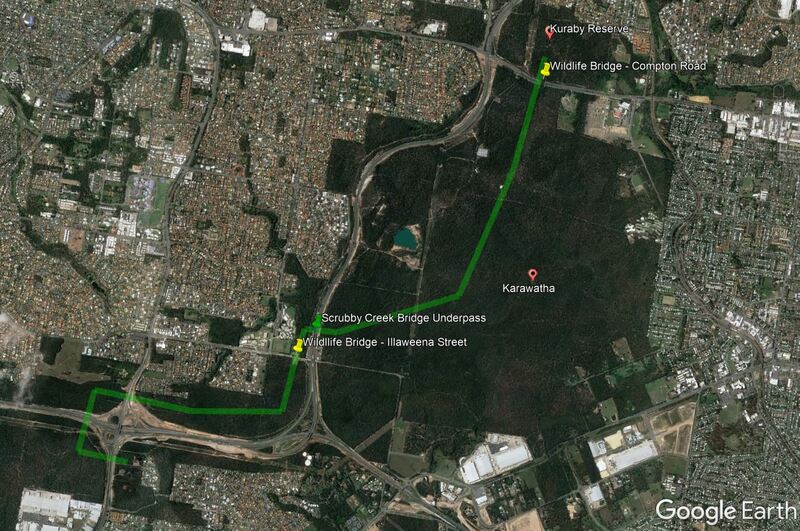 We are working with Cr Steve Hung to develop a plan for a wildlife bridge across Klumpp Road to link to Roly Chapman Bushland Reserve. A beautiful day for a walk in the bush. 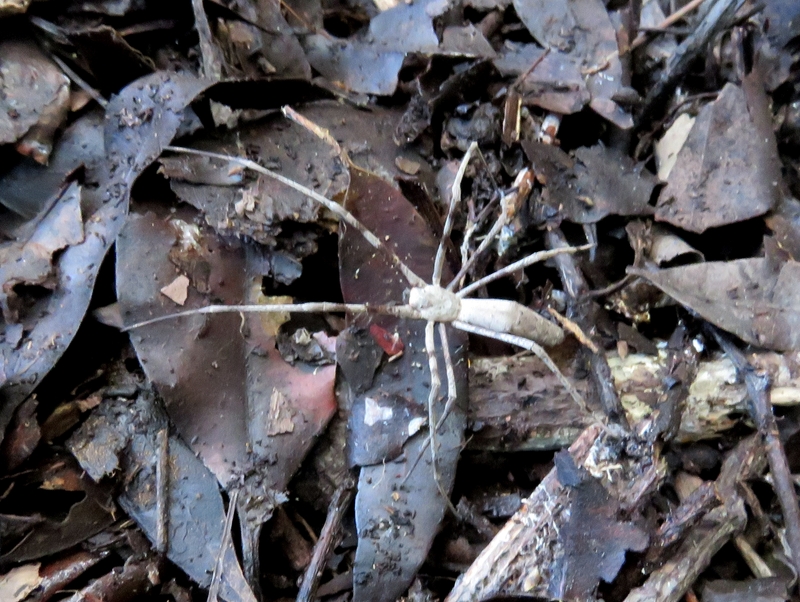 I joined Professor Darryl Jones, Griffith University and members of Karawatha Protection Society for a field trip to explore the Fauna Movement Solutions linking Kuraby Forest and Karawatha Forest across Compton Road. The discipline of Movement Ecology only developed around 2002 so building this innovative wildlife bridge in 2005 was a bold step. At the time traffic on the two lane Compton Road was rapidly increasing with a consequent increase in road kill. 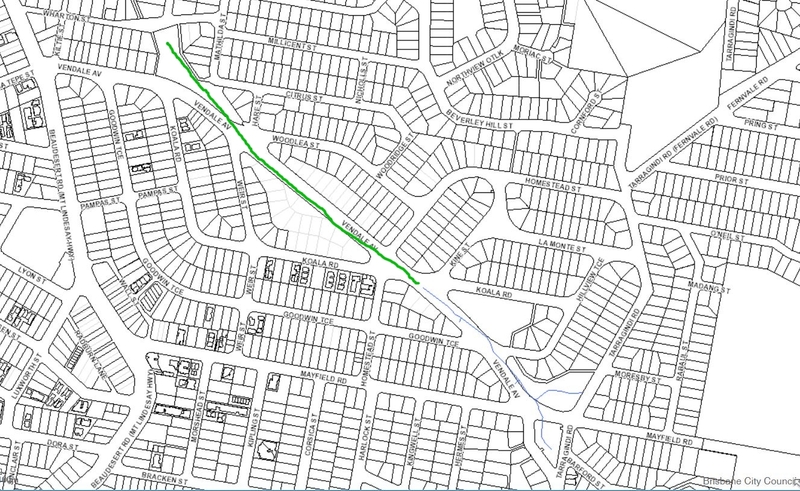 The Brisbane City Council decision to widen the road to four lanes was both a threat and an opportunity if the partnership of Karawatha Protection Society and Griffith University could change the existing thinking from protect wildlife by keeping it off the road to making the road ‘transparent’ to wildlife. In his presentation Darryl Jones highlighted the importance of community groups in driving change even when the science is clear. What makes this project courageous is the fact that the science of Movement Ecology was only just evolving and researchers have since found many unexpected results. 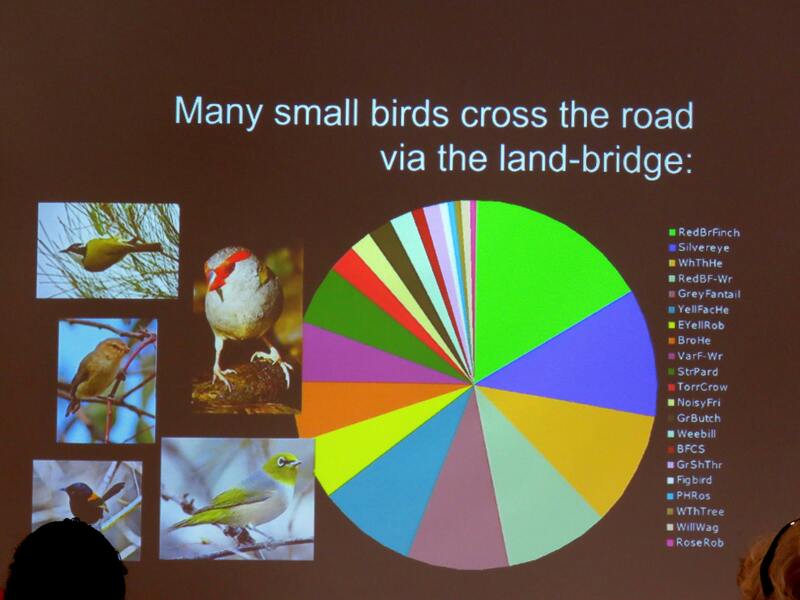 Small birds are one surprising user of the wildlife bridge. 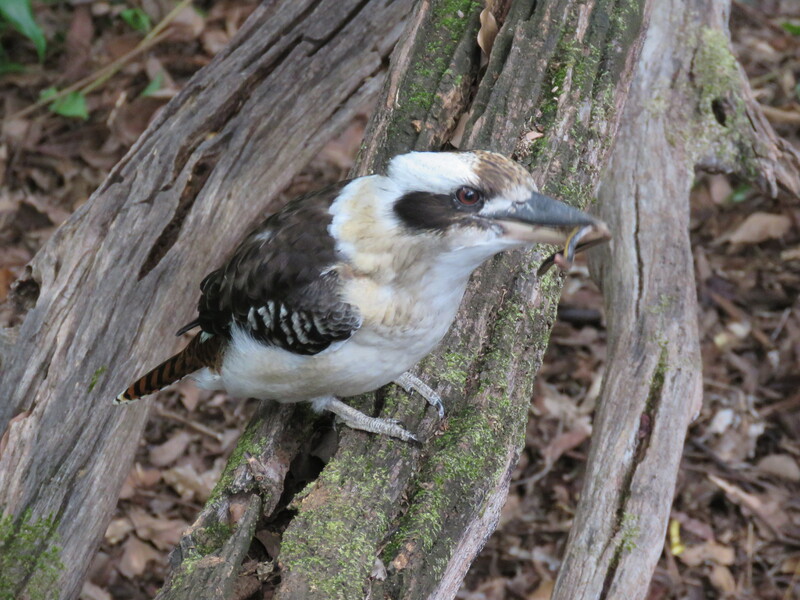 Small birds will normally not cross a wide gap in the forest canopy so being limited to an island habitat they are vulnerable local extinction events like bushfire. The other surprise is the behaviour of micro-bats. The concrete arch sections have become unexpected Shelter with micro-bats making homes in the gaps in arch sections. Each night the bats emerge to forage in the surrounding forests. 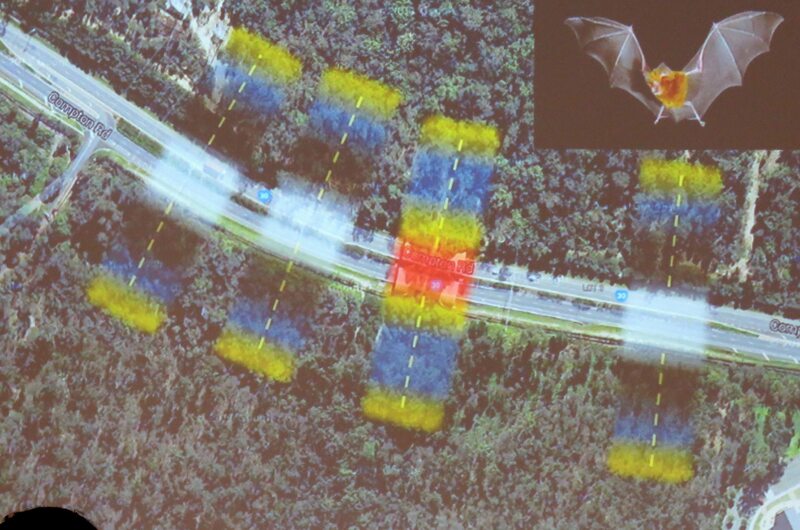 Monitoring with ultrasonic (anabat) recorders shows no activity above the road (white), significant activity about 100 metres from the road (yellow) however the wildlife bridge itself was a hotspot (bright red) for micro-bat activity transiting from forest to forest. 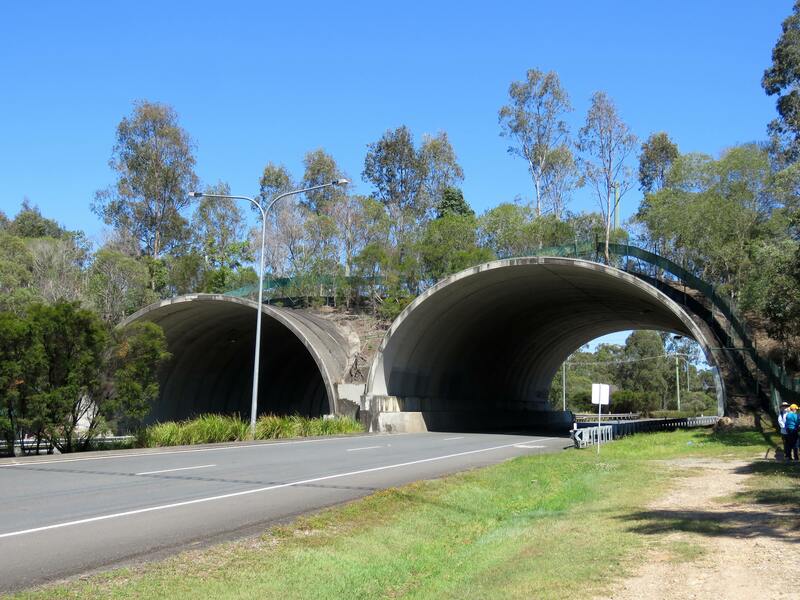 As part of the Logan [Motorway] Enhancement Project Transurban Queensland is building sophisticated fauna movement solutions including a new wildlife bridge across Illaweena Street which will reduce the road kill on that increasingly busy road and allow for future expansion to four lanes. Combined with underpasses and rope bridges this will create excellent fauna movement solutions linking Kuraby through Karawatha Forest to habitat at Parkinson. 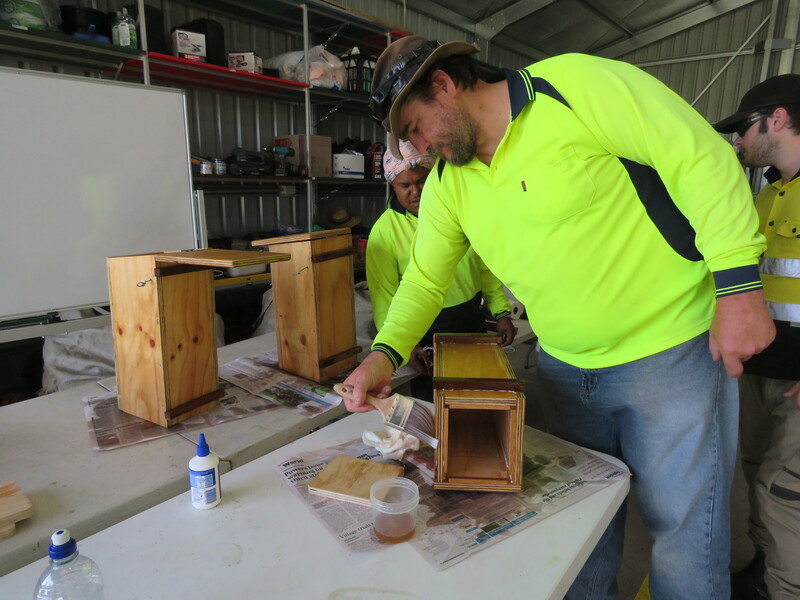 I’m not sure who was having more fun during the Backyard Bee Home Workshop at Downfall Creek Bushland Centre yesterday. The Downfall Team host a number of school holiday Nature Ranger activities. 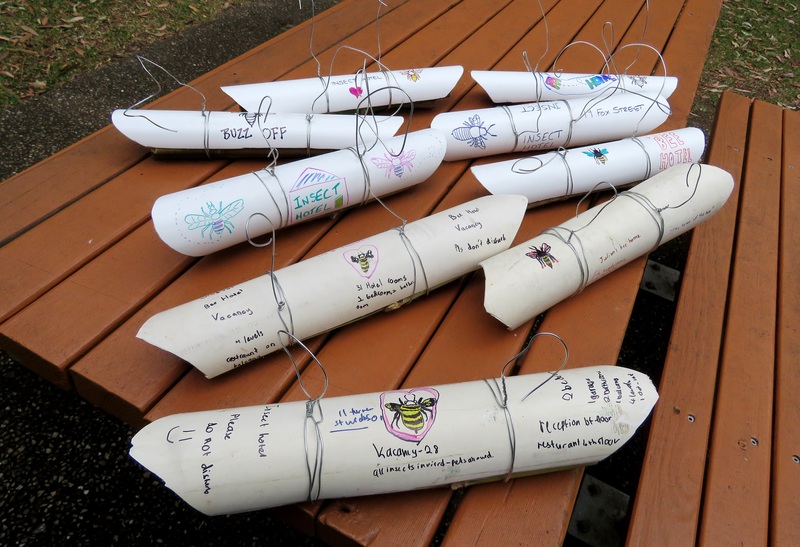 Jake Slinger and I represented Pollinator Link® building Bee Homes with the Nature Rangers. Working with the Nature Rangers was great fun. 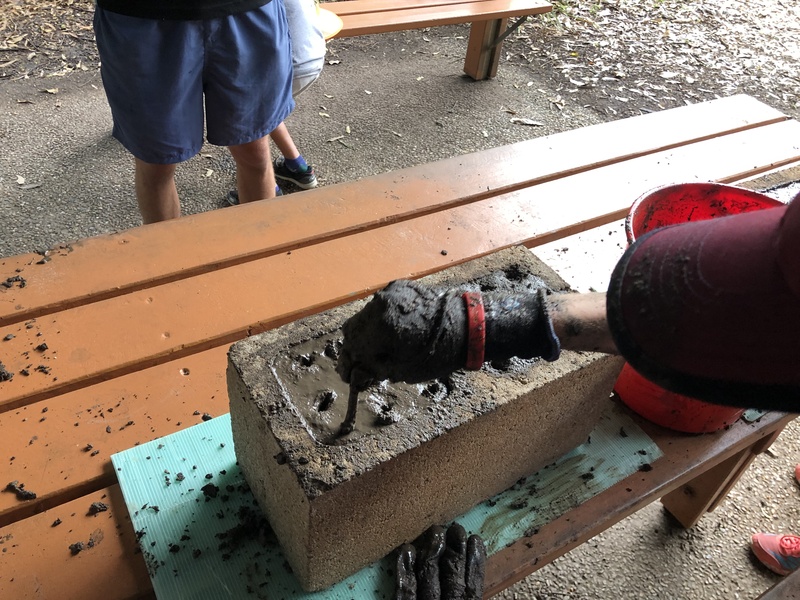 I introduced them to some of the 2,000 species of solitary native bees and the different types of nests the female creates in hollows, in the ground or by carpenter bees chewing into soft timber. 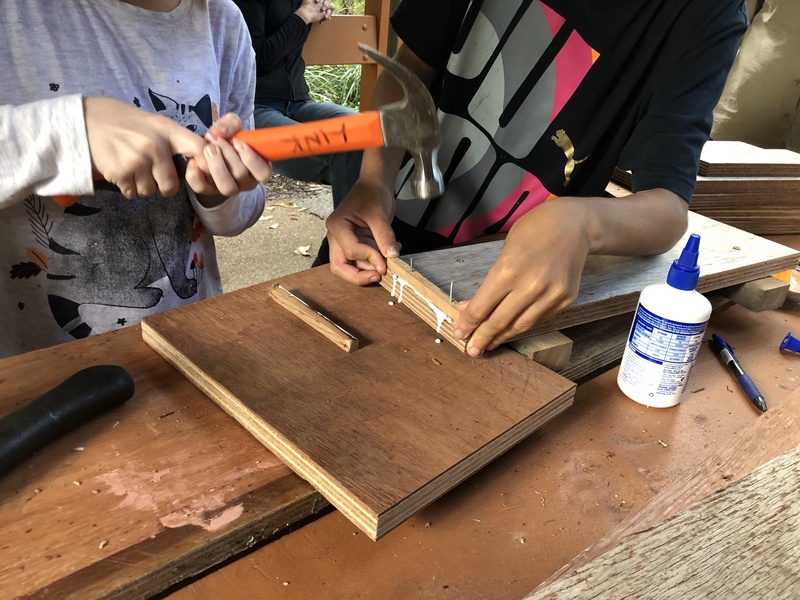 The Rangers then dived into assembling their individual Bee Homes using bamboo for Leaf-cutter Bees and Lantana for carpenter bees. What really blew me away was the artwork they created. 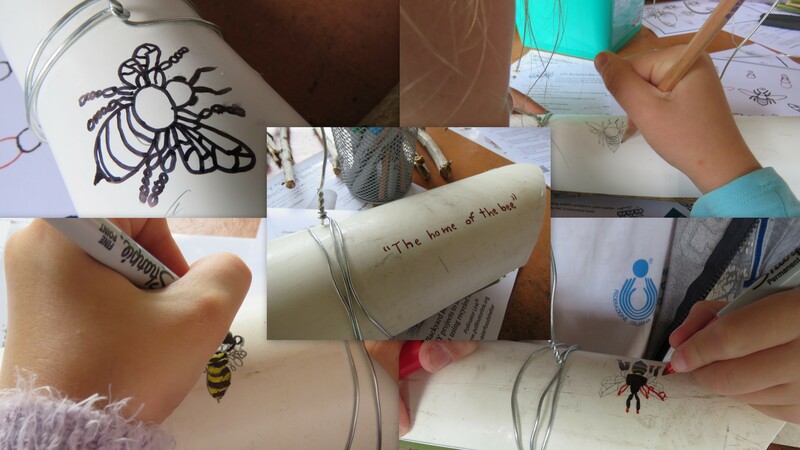 We provided a “How to draw a bee” guide from ArtforKidsHub.com, multi-coloured Sharpies and the Rangers went to work producing amazing artwork to decorated their Bee Homes. Downfall Creek Bushland Centre is a great location for environment related workshops with conference facilities and outdoor areas. Today I had the honour of meeting the Greening Moorooka [Bushcare] Group who have been building a Pollinator Link between the western section of Toohey Forest and Moolabin Creek. 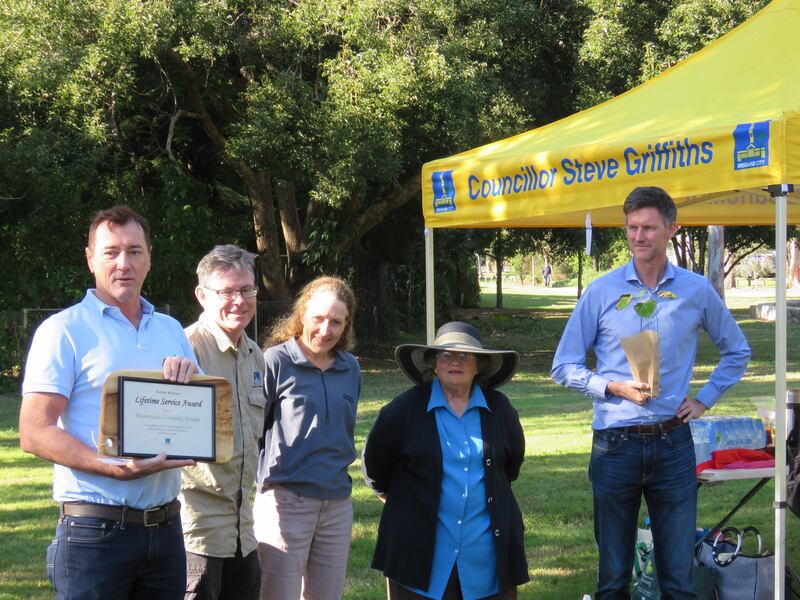 Today’s event was a community planting in Moolabin Park to celebrate the 20th anniversary of the Greening Moorooka Group’s work restoring and protecting a chain of parkland forming a wildlife corridor linking Toohey Forest with Moolabin Creek which feeds into Oxley Creek. The chain of parks: Mayfield Gardens, Peggs Park, Koala Park, Moolabin Park, follow the line of a creek that originally rose in Toohey Forest. In 1998 the Group started planting in Mayfield Gardens then progressively move through restoring Peggs and Koala Parks to Moolabin Park. Maureen is particularly proud of the way the bike paths and amenities have brought young and old into the park as a destination in itself and as an avenue for exercise and recreation: safe community space. A founding member, Jean’s vision fuelled the group for many years. John and Maureen have a special story of their own. Two of the original founding members of Greening Moorooka Group they have been joined first by Rachel then Ryan. The smiles tell the story of a special family proud of what they have achieved for their community. Long-term/founding members including Cr Steve Griffiths, Kathleen, Barbara, Helen, MaryAnne were also there to celebrate. Register to receive your Pollinator Link fence sign. A beautiful sunny morning in the park, what a great opportunity to introduce Pollinator Link to community members who really understand the importance creating habitat for our urban wildlife. 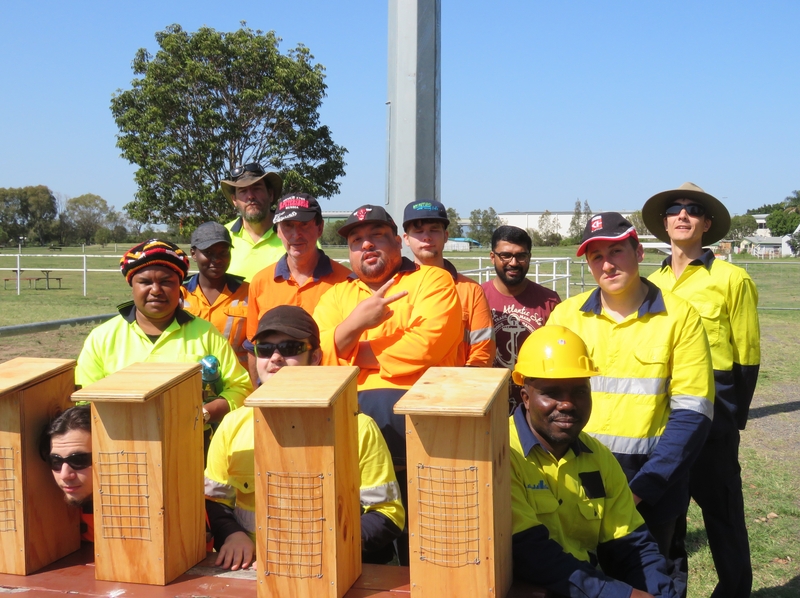 I fielded a lot of questions about building Habitat Tripods to provide food and shelter for small birds, the importance of Planting Local to Feed Locals, using GroNative app and where to get local south-east Queensland plants: Community Nurseries. Congratulations to the Greening Moorooka Group on 20 years of valuable visionary contribution to our wildlife and community.